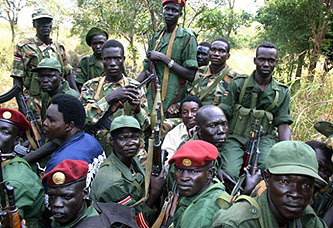 The Lord’s Resistance Army, led by Joseph Kony, is one of the nastiest, most brutal and evil organizations on the planet….It’s little surprise that the Lord’s Resistance Army Disarmament and Northern Uganda Recovery Act of 2009 has widespread support in the Senate, including 63 Cosponsors. But because the Senate’s rules are dumb, and because Senator Tom Coburn (R-Oklahoma) is a moral monster, guided by a poisonously misguided ethical compass and a callous disregard for human welfare, there’s been no vote on the bill thanks to Coburn’s hold. A “hold” is placed when the Leader’s office is notified that a Senator intends to object to a request for unanimous consent (UC) from the Senate to consider or pass a measure….Holds can be overcome, but require time consuming procedures such as filing cloture. Cloture is a motion to end debate that requires 60 votes. I’m still a little confused about this. If you mount a filibuster, you’re basically informing the Senate leader that you intend to withhold unanimous consent to pass a bill. This can be overcome with a cloture motion, which requires 60 votes. Likewise, according to Coburn, if you place a hold, you’re informing the Senate leader that you intend to withhold unanimous consent to pass a bill. This can be overcome with a cloture motion, which requires 60 votes. So why are there two different names for the exact same process? On a related note, if the Lord’s Army bill has 63 cosponsors, why not just bring it to the floor, cut off debate, and pass it? Coburn’s filibuster/hold can delay the bill for a while, but he can’t stop it. So what’s the holdup? UPDATE: As I expected, the holdup has to do with the delays involved in breaking a filibuster. But what exactly are those delays? The first is “ripening,” which means that cloture motions aren’t voted on until two days after they’re introduced. But during those two days the Senate proceeds with other business, so that doesn’t really cause any calendar difficulties. The second is that there’s a 30-hour post-cloture debate rule. So once cloture is voted on, Coburn and his pals can, if they want, chew up 30 hours of floor time with debate, amendments, quorum calls, etc. But they actually have to do it. If they don’t, then presumably the Senate proceeds with other business and there’s no real impact. So the question is: is Coburn really willing to spend 30 hours on the floor for every one of these bills he puts a hold on? And since each senator is limited to one hour of post-cloture debate, can he round up enough friends to take up the rest of the time? Once or twice, maybe he could. But I wonder how many bills he’d be able to do this on before he (and the rest of the Republican caucus) ran out of steam? There’s probably more to it than this. There are a million ways to obstruct business in the Senate, after all, and most bills have to be voted on more than once. But although breaking a filibuster when you don’t have 60 votes really is nearly impossible, it seems at least possible that post-cloture obstruction could be reduced a lot if Coburn’s bluff were called a few times. Anyone with parliamentary expertise, though, is welcome to chime in on this.